Washington DC’s Metro offers a convenient way to get to the most popular tourist attractions in the nation’s capital including the museums, the national memorials, the White House, the Capitol Building and much more. 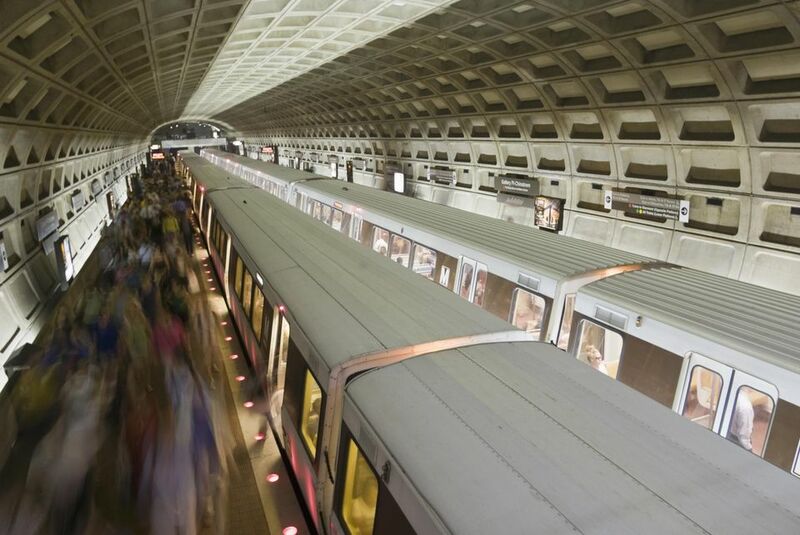 While getting around the city can be confusing, many metro stations are very close to one another and have good access to the National Mall and Downtown. Some of the attractions are within walking distance to several stations, so the most convenient one will depend on which line you are traveling on. Use this as your guide to the top five metro stations to see, including information about the entrance and exit locations, the attractions near each station, and additional sightseeing and transit tips for Washington D.C. The Smithsonian Station is located directly on the National Mall. At the northern exit, you will see a breathtaking view of the U.S. Capitol Building to the east and the Washington Monument to the west. The station offers the closest access to the Smithsonian Museums, including the Smithsonian Castle (pictured above), the Freer Gallery of Art, Arthur M. Sackler Gallery, and the National Museum of African Art. Across the Mall, you will find the National Museum of American History, the National Museum of African American History and Culture and the National Museum of Natural History. The national memorials and the Tidal Basin are within walking distance as well as popular museums including the Holocaust Memorial Museum, the Bureau of Engraving and Printing and the National Gallery of Art. Transit Tip: During large events and peak travel times, the Smithsonian Station will be very busy, so you might want to avoid waiting for the train by walking to another station. Choose one that allows you to travel directly without changing lines if possible. Nearby Metro stations include Federal Triangle, Metro Center, Gallery Place-Chinatown, L’Enfant Plaza, Federal Center SW, and Archives-Navy Memorial. Where to Eat and Drink: Besides the food trucks that buzz around the National Mall, a few of the museums have critically-acclaimed cafeterias. Try fry bread at the Mitsitam Cafe at the National Museum of the American Indian and Louisiana catfish po'boys at the Sweet Home Cafe in the National Museum of African American History and Culture. Located in Washington DC’s Penn Quarter neighborhood, Gallery Place / Chinatown Station provides access to some of the area’s best restaurants, shopping, nightclubs, as well as the Capitol One Arena, the National Portrait Gallery and Smithsonian American Art Museum, the International Spy Museum, Madame Tussauds Wax Museum, the Crime Museum, the Newseum, Ford’s Theatre and the Shakespeare Theatre. The Metro station is centrally located in the heart of the city within walking distance to the National Mall in one direction and to the Washington Convention Center in the other. Gallery Place/Chinatown is a transfer station where riders can change lines to head in a different direction. Transit Tip: The station is right next to the Verizon Center and can be very busy before and after a large event. If the station is crowded, head to a nearby station. Look at a map and choose the one that allows you to travel direct without changing lines. Nearby Metro stations include Mount Vernon Square, Judiciary Square, Federal Triangle, Metro Center, and Archives-Navy Memorial. Where to Eat and Drink: The stretch of 7th Street in Penn Quarter is sometimes known as "Restaurant Row." You'll find so many dining choices here, from gigantic pieces of lasagna at Carmine's to lobster rolls at Luke's Lobster. The Metro Center Metro Station is located just a few blocks north of the heart of Pennsylvania Avenue, the historic street that is home to many of Washington DC’s parades and festivals. The White House is just a short walk to the west, and the National Mall is a few blocks to the south. The National Theatre, Ford's Theatre Museum, the Warner Theatre, and many of the city’s best restaurants are within walking distances. Transit Tip: While other stations are closer to the Mall, Metro Center is a transfer station so it is easy to get to from multiple lines. You can change trains, but it is a pretty easy walk from there to the National Museum of Natural History, the National Museum of American History, and even the Washington Monument. Nearby metro stations include Federal Triangle, Gallery Place-Chinatown, McPherson Square, Judiciary Square and Archives-Navy Memorial. Where to Eat and Drink: This area of town is where many office workers spend their days, so you'll find plenty of fast-casual restaurants like &Pizza, Chop't, TaKorean, the Devon & Blakely sandwich shop, and District Taco. For a leisurely meal, there's famous local chef José Andrés' Greek restaurant Zaytinya, or hop over to upscale shopping center CityCenterDC to try Fig & Olive, Centrolina, Del Frisco's Double Eagle Steakhouse, DGBG Kitchen and Bar, and Momofuku. Located near the Navy Memorial and Heritage Center and the National Archives, the Archives Metro station is one of the closest to the National Mall, just a few blocks from the National Museum of Natural History, the National Gallery of Art (pictured above) and the Newseum. The U.S. Capitol, the National Air and Space Museum, the Hirshhorn Museum, the Smithsonian Castle and the National Museum of the American Indian are also within an easy walk. Transit Tip: Nearby metro stations include Smithsonian, Federal Triangle, Gallery Place-Chinatown, Capitol South, L’Enfant Plaza, Federal Center SW, and Metro Center. Where to Eat and Drink: There are a variety of dining options near the station, including inexpensive eateries like local fast-casual Indian restaurant Merzi and zen-like healthy tea shop and eatery Teaism. Penn Quarter neighborhood is one of the city's dining destinations and has plenty of options you can choose from. The L'Enfant Plaza Metro Station is located on the south side of the National Mall near the Hirshhorn Museum and Sculpture Garden (pictured above), the Smithsonian Castle and the National Air and Space Museum. Although it is a long walk, the station provides the easiest access to the Tidal Basin, the Jefferson Memorial and the Franklin Delano Roosevelt Memorial. The National Museum of American History and National Museum of Natural History are within an easy walk as well. L'Enfant Plaza is a transfer station so it is easy to get to from multiple lines. Transit Tip: L'Enfant Plaza Metro Station is near the National Mall, but tends to be less busy than the Smithsonian Station. It is a good option during busy times of the year. Nearby metro stations include Smithsonian, Federal Triangle, Gallery Place-Chinatown, Capitol South, Federal Center SW, and Metro Center. Where to Eat and Drink: There's a food court within L'Enfant Plaza with plenty of quick and inexpensive eateries like Potbelly, Five Guys, Amsterdam Falafel, and many more. If you're don't mind waiting for a free shuttle bus or taking a a long walk (15 to 20 minutes), you can head down from the L'Enfant Plaza Metro Station to D.C.'s newest mixed-use development on the waterfront The Wharf. This new hotspot is the site of many restaurants, from Shake Shack to ritzy options like Spanish restaurant Del Mar.